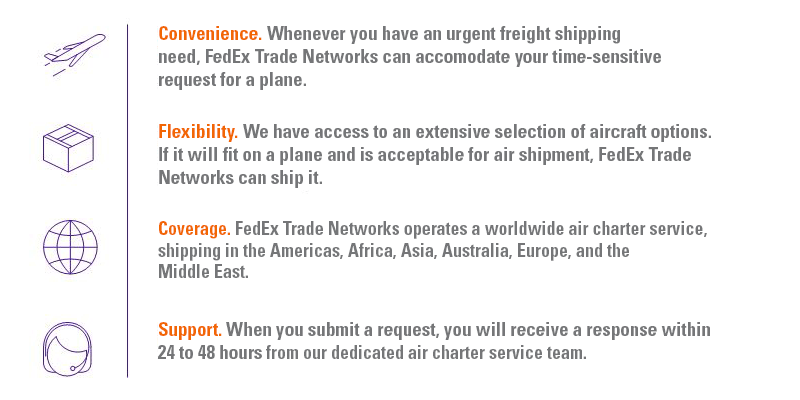 FedEx Trade Networks air charter service provides a custom fit for international freight shipments. When should you use air charter service? For air charter information, please contact your local FedEx Trade Networks account executive or call 1.800.249.2953. Choices. Tailored, end-to-end solutions use the modes and carriers that most effectively support your costs and scheduling. Visibility. Cutting-edge technology allows you to track, trace and analyze your complete supply chain. Coverage. Global reach with a fully integrated supply chain is driven by a globally recognized brand: FedEx. Support. Superior service quality is enabled by longstanding relationships with customers and a commitment to security and compliance.